What's more charming than charms? Personalise this Black Watch Charm Bracelet with any message of up to 35 characters over 3 lines. This twist on 21cm charm bracelet comes with black and white charms that you simply twist on to the bracelet to make any design you like. The additional watch charm makes this an ideal but practical gift. The set includes-5 x Black Patterned Beads, 2 x Butterfly Clips, 1 x Jewelled Butterfly Bead, 1 x Jewelled Swirl Bead, 1 x Watch charm, 1 x Heart Tag. 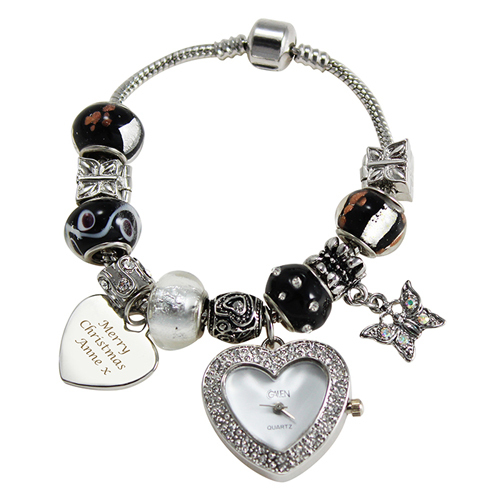 Personalise this Black Watch Charm Bracelet with any message of up to 35 characters over 3 lines.